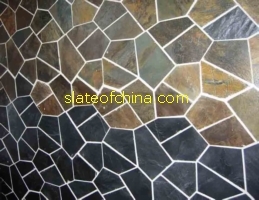 Random Paving Stone, crazy paver, meshed slate, net pasted slate is widely used in indoor flooring, outdoor paving, sideway, paveway, road of massage stone. Stone piece such as slate tiles are mounted on the net. We offer the different types of slate network by ourselves or according to drawing and demands. 1.Usage: both for interior and exterior decoration, road paving or plaza paving material. 2.Color: rusty, cyan, beige, yellow, black, or according to your requirements. 3.Size & Thickness: 7 pcs/sqm, or according to your requirements. 4.Materials: culture stone, slate, sandstone, quartzite, etc. 5.Package: calibrated export packaging such as seaworthy wooden crate. 6.MOQ: one 20ft container, mixed order acceptable. 7.Advantage: environmental materials with non-toxic, insulate heat and cold insulation, Acid resistance, alkaliproof. Please feel free to contact us if you are in the need of them. Slateofchina Stone Company is a leading Chinese slate quarry owner and slate supplier. Slateofchina Ltd mainely produces roofing slate, flooring slate, paving slate, wall cladding slate, culture slate, mushroom slate, random slate, billiard slate, Slate dish, slate plate, slate tray, placemat, slate board, slate coaster, slate cheese board etc from our own Chinese slate quarry. Our slate conform to BS680(1971) and EN12326 standards.Based on the rich natural resources, we have succeeded in supplying a wide range of top quality slates and relevant stone products for our customers around the world in great quantity every year at most competitive prices. We expect to establish long-term cooperation with you in future.